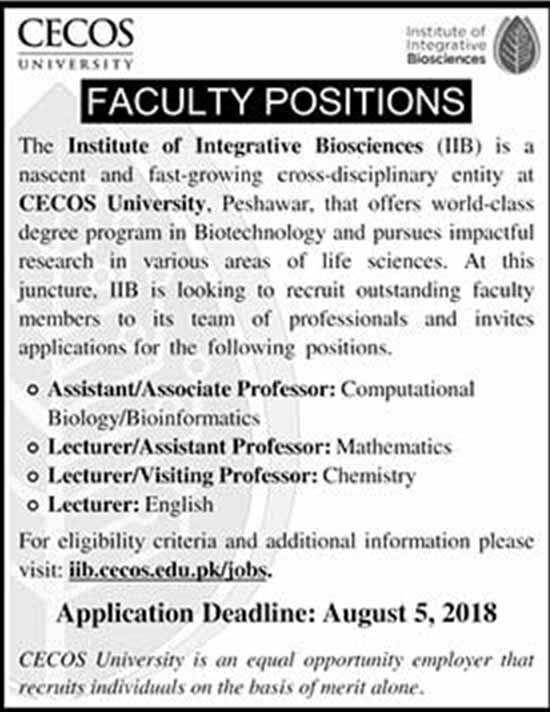 The Institute Of Integrative Biosciences CECOS University Peshawar Khyber Pakhtunkhwa. The Institute of Integrative Biosciences (BB) is a nascent and fast-growing cross-disciplinary entity at CECOS University. Peshawar. that offers a world-class degree program in Biotechnology and pursues impactful research in various areas of life sciences. At this juncture. IIB is looking to recruit outstanding faculty members to its team of professionals invites applications for the following positions. CECOS University is an opportunity employer that recruits individuals on the basis of merit alone.